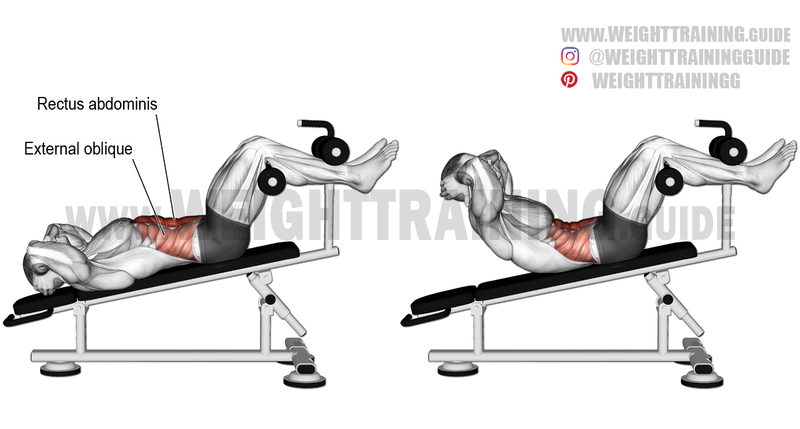 Lie on your back (supine) on a declined bench and hook your feet under the rolls. Position your hands either across your chest or behind your head or neck. To protect your lower back, press it down, against the bench. Keeping your neck neutral and lower back pressed against the bench, exhale as you raise your head and shoulders off the bench by flexing your abdomen. Inhale as you lower your head and shoulders back to the starting position and relax your abdomen. Keep your neck neutral; there should be lots of space between your chin and sternum. Don’t allow any momentum to build up; keep the movement slow and under control. By fully relaxing your abdomen before each contraction, you will ensure that your muscles fully and dynamically contract during each repetition. Make the decline crunch more difficult by keeping your arms stretched up, or by holding a weight plate either on your chest or behind your head. See also the decline sit-up and twisting crunch. Keep on working out, great job!